That's why it's so important for pet parents to choose a training reward that's not only delicious enough to motivate their canine student, but also low enough in calories that it can be given repeatedly without causing the dog to break the scales. Crazy Dog Original Train-Me! Mini Training Rewards were designed specifically to meet these training demands. 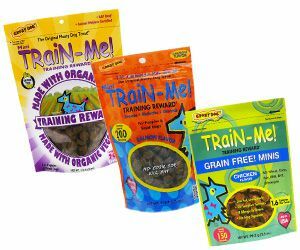 At just 1.5 calories per treat, Crazy Dog Original Train-Me! Mini Training Rewards are perfect for repetitive rewarding. Our 30-pound dog can consume up to 32 Crazy Dog Original Mini treats daily without going over the 48-calorie limit. That's enough for some serious training - plus a few extras left over for showing the pup some love and affection after the lesson is over! In addition to the Originals, Crazy Dog Minis are available in Grain-Free and Organic varieties, which are also very low in calories, at just 1.6 and 1.7 calories per treat respectively. Original Minis are available in mouthwatering Beef, Bacon and Chicken Flavors, while Grain-Free Minis are offered in Bacon and Chicken Flavors, and Organic Minis in Beef and Chicken Flavors. All varieties of Crazy Dog Train-Me! Mini Training Rewards contain meat as their number one ingredient. This gives them such a delectable aroma and taste that canine students will immediately focus on the task at hand and be motivated to perform. The learning curve will be shortened - without having to use high-fat rewards, allowing dogs to maintain a healthy weight during training. This brings up another strategy trainers and pet parents can use to keep pups-in-training from packing on the pounds: give fewer rewards. Research has shown that once a dog has learned a command or behavior, he may actually retain that behavior better if he is not rewarded every time he performs it. For example, once a dog reliably obeys the "Sit" command, try withholding the treat reward and giving it to him only every second, third or fourth time he sits on command, varying the intervals. Behaviorists call this intermittent reinforcement. 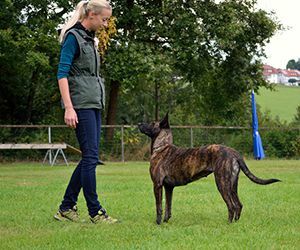 Intermittent reinforcement can make a dog's learned behavior very durable. He knows it will eventually pay off so he becomes more focused and will try harder to perform the desired action. With intermittent reinforcement, it's truly a case of "less is more," since you get better training with fewer rewards. When this strategy is combined with a low-calorie, treat that's also very irresistible - like Crazy Dog Train-Me! Mini Training Rewards - trainers and pet parents have a powerful one-two punch for eliminating the problem of weight gain during training.